A satellite designed to provide high-speed internet services to 200,000 Australians living in rural areas has been launched from South America. A 780-tonne rocket carrying the A$500m (£231m; $350m) communications hardware blasted off from French Guiana without incident in fine weather. The satellite is reported by Australian media to be one of the most expensive commercial satellites ever launched. It has been described as the "great hope" of Australia's broadband network. The satellite, known as Sky Muster, is designed to deliver broadband internet services to Australians in remote areas, including Norfolk, Christmas, Macquarie and Cocos islands. Sky Muster was launched shortly before a smaller Argentinean communications satellite from the same rocket. "It's one of the world's largest communication satellites and is purpose-built to deliver broadband to Australia - an incredibly vast country," National Broadband Network (NBN) spokeswoman Frances Kearey was quoted by ABC as saying. "The NBN satellite service will provide speeds that people in the cities take for granted - opening up new opportunities in education, health, social connectivity and business." 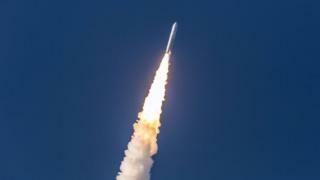 It is hoped that Sky Muster will be connected to NBN users by the second half of next year - after a series of tests have been carried out. After its launch the satellite travelled through the earth's atmosphere attached to the European-made Ariane 5 rocket at speeds approaching 11,000km/h for about 11 minutes before reaching space, the Financial Review's James Chessell - who witnessed the take-off - reported. The flawless lift-off was witnessed by senior NBN officials from a control room in the Arianespace launch centre on the edge of the Amazon rainforest. NBN Chairman Ziggy Switkowski said that it had been "a historic day". Sky Muster and another satellite due to be launched in the beginning of 2016 have been strongly supported by Prime Minister Malcolm Turnbull - who in his previous job as communications minister championed it as the best way of tackling slow broadband speeds in rural areas.